I am all for open access, my own initiative being sciphu.com – still in early stages and with several unresolved issues. Issues that may prove to be altogether unresolvable, because of the extreme openness of the blog-publishing concept. Still, as a tribute to the open access initiative and in the spirit of such extreme openness I am proposing another open access category: “open access job-applications”. Please find my first contribution below. I hereby apply for the above position. My background is biochemistry / molecular biology. I earned my Ph.D. in 2000. I’m now working in diagnostics research and development, mainly using gene technology methods. I write two blogs commenting on the use of biotechnology: one in Norwegian (genom.no) and one in English (BIOpinionated.com). I participate in forums that discuss biotechnology and biomedicine on a daily basis. I have previously written contributions to the debate in Norwegian newspapers (see attached CV for references). I am passionate about my discipline and nurture a strong desire for an advisory board with a proactive commitment. 1. Correcting past sins. Including i) the biotechnology advisory board’s predominantly negative attitude to GMOs and Biomedicine with populist statements about HPV vaccination as the most glaring example, ii) the boards warm support to the world’s strictest regulation of genetic tests and other medical applications of biotechnology wherein the definition of pharmacogenetics as “presymptomatic testing” is the grossest example, and the mandatory stamp of approval given to only very few selected laboratories is a generally descriptive example of contributions to over-regulation, iii) the board’s support for a biobank law that has nearly eradicated clinical trials in a country that could have contributed enormously. If hired, I will attempt correct this by involving qualified persons that can inform about the harmful effects to research and development, of such over-regulation. 2. Change the current technology-hostile attitude of the board. Our country is in a unique position to develop technologies for the future, we have money and we have human resources. We should also be very well positioned to address ethical issues related to biotechnology since we are a law-abiding people living in a well-functioning (and thoroughly regulated) democracy. Norway’s prerequisites should ignite a wholehearted investment in biotechnology to help solve medical, environmental and economic problems to the best of both Norwegians and the rest of the world. Instead, fear of technology has won out among politicians and bureaucrats, including the biotechnology advisory board. Combined with a precautionary approach that is more pronounced with us than any other country natural to compare to, we have been left behind in what could have been thriving industry oriented biological technology development. One suggestion for improvement is tolisten to resourceful people with constructive ideas for the ethical use of biotechnology. Furthermore, I propose to include a technology-friendly mission statement that ensures that the biotechnology advisory board always keeps technology’s potential as a starting point rather than focusing on (real or non real) damaging effects of biotechnology. There are tremendous opportunities in biotechnology, and in recent years advances in the field have shown us that much of the fear of this technology have been exaggerated. A natural skepticism should be maintained, but a shift towards a basic positive attitude is needed. I have professional skills, I am flexible, outgoing and self-sustained. I can contribute in a positive and challenging manner if I was offered this job. Regardless of the application outcome I request that my appeal for a more technology friendly attitude be considered carefully. I must admit that I am not a fundamentalist myself, nor am I sure I will ever become one. But I try to advocate open access, and as much as possible I follow the first two steps below. In addition, I have set up a free site for anyone to publish according to step 3 which is sciphu.com (but any site will do…..ideally one using widely accepted publication identifiers – sciphu.com isn’t…yet). Following the recommendations in step 1 and 2 makes you a supporter and Open Access activist. Following recommendations in step 3 will make you a full-fledged Open Access Fundamentalist……. 1. Supporter stage. Openly support initiatives like PloS and contribute to activities like Open Access day. a) Publish in Open Access journals as much as possible. b) Mail authors for reprints. Whenever you need an article published in a pay-for-access journal, write to the corresponding author asking for a reprint. Even if you have access through your institutional subscription (or get it through friends and colleagues), write the author to notify him/her that the paper is not open access. This increases awareness…. 3. Fundamentalist stage. Send in your paper to be peer reviewed like you normally would (preferably to a pay-for-access journal). Receive your reviewer comments, edit according to those comments, but do not send your manuscript back to the journal. Rather, publish on freely accessible web page. Include the peer-reviews if you want, but clear this with the reviewers first. Everyone should have access to the same scientific information (what that information should be is the subject of another post). It’s not even about who pays for it. It is science, and as such belongs to everyone. This post is my entry for Open Access Day 2008. It is about blogging, peer-review publishing, open access, elitism, prejudice and exclusion. I had this dream: publishing directly on the web mixed with interactive comments to individual publications was to replace traditional peer-reviewed publishing in scientific journals. I set up SciPhu.com to achieve this. The core idea was (and still is) that any publication would remain fluid in its format and content since communication with referees was continuous and interactive. By letting the publication evolve in this way it should asymptote towards perfect. I realize now that I was a bit naive in believing this could completely replace a system that has worked so well for so long. The system has after all allowed the scientific community to retain an unsurpassed credibility, worldwide. But……..I am not accepting defeat just yet, because traditional peer-review publishing has it’s problems. Firstly, most articles published are not open access. That means that if you need a scientific article and you do not work in an institution that has paid a large amount of money for subscription to the given journal (or you have a private subscription) you will not be able to access it (you can pay for individual articles, but that will become very expensive over time). In contrast, blog publishing would be free and accessible to all. The cost of publishing on a blog is very low indeed. It does not need printing and it will not need conventional employees. Editors and peer-reviewers (those who comment) would all be doing work on a volunteer basis. Consequently, no need to charge the readers,…….- at least not for scientific use (commercial use could potentially have a different set of rules). Secondly, traditional paper-publishing is painstakingly slow and, compared to web-publishing, extremely inefficient. Blogs and scientific news-sites can publish in a matter of minutes and provide continuous updates (and corrections) on almost any topic. Also, web-publishing allows you to track your readers in an unprecedented way, – and most importantly, it provides a feedback channel for them. This feedback I think is essential in the next era of publishing. It does however, need some structure. The commenting anarchy of today will not suffice. My concern is that publish first, comment second represents an easy way around the rigors of review by experts in which publication is dependent on positive reviews and revision. I am all for open discussion, but initiatives started by people who don’t publish much in the peer-reviewed literature or do not themselves review many manuscripts do not really appeal to me because it adds to my sense of concern that this is a backdoor. I am not trying to seem elitist, I am just saying that peer review, for all its problems, is there for a reason. Submitted by T Ryan Gregory on 22 May 2008 – 8:10am. May I ask what your record is in terms of reviewing manuscripts and publishing peer reviewed articles? Submitted by T Ryan Gregory on 22 May 2008 – 9:00am. One might also be forgiven for thinking that someone with only a few publications might be looking to skip the hard (but necessary) stage of getting through reviewers. Isn’t it a bit odd to complain about the anonymous nature of peer review while moderating a “review” blog anonymously? Submitted by T Ryan Gregory on 22 May 2008 – 9:00am. Peer review isn’t supposed to be democratic. It is supposed to be done by peers — a set of individuals with highly specific knowledge in a particular field. The democratic part comes only once the paper gets through that filter, when it is made accessible to the entire community. Peer review is a vetting process, not a rating process. Submitted by T Ryan Gregory on 22 May 2008 – 9:42am. This is very true. What I am saying is that I hope that it will be different in the future. Sciphu is probably not the final solution, but it is a starting point. And hopefully one of many similar initiatives to come. A site like this can be developed into a wiki or it can have staffed (unpaid) experts in given fields as reviewers or it can develop in any other direction. But, and this is important, it should never require fees of any sort from either referees, authors or readers. There are no fees attached to the sciphu site (it doesn’t even have google adds), it’s all non-profit scientific idealism. Submitted by Sciphu (not verified) on 22 May 2008 – 10:21am. 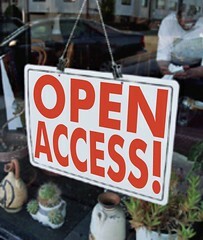 Money and open access, – this is the imperative issue that needs to be sorted out. Development of new publishing methods will most certainly follow. Peer-review publishing is dead, long live peer-review publishing. Hence I pledge my complete and unrestricted support to any open-access initiative.